"GIVE SPAIN a chance" was the message of my colleague today. I must admit, aside from sherry, I don't generally give hispanic wines much thought, my palate too often sullied by sappy, decrepit examples with flaccid fruit marred by oak. This new wave Verdejo from Rueda (no resemblance to Verdelho) was well worth a second swig, however, being fresh, oak free, with a slight Albarino pull (though fuller) a pear palate and lemon pith on the aftertaste. A good match with paella stained with saffron. 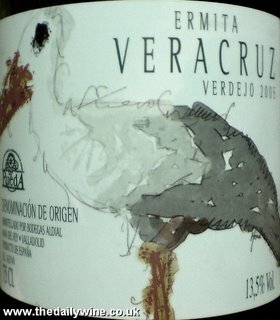 According to the importers, 'in the bell-tower of this [bodega's] chapel a pair of storks nest every year, and they are the inspiration for the label'. I say pluck then place them in the paella.